Keep your FireAde extinguisher secure and within easy reach. 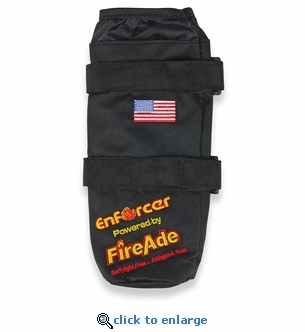 This FireAde extinguisher holster is made from durable vinyl and includes 2 heavy duty velcro straps for securing to roll bars or posts. Provides quick access to your fire extinguisher in an emergency. Easy installation, no screws, bolts or clamps. This extinguisher holster can be used on all off-road vehicles including Jeeps, ATVs, Golf Carts and more. Will accomodate 16 oz and 22 oz. Fireade 2000 aerosol extinguishers and most extinguishers with a 2.5" diameter cylinder.